The oil sludge residue presents an aggregate of hydrocarbons, organic and inorganic impurities, and water. The microporous and mesoporous zeolites are considered promising catalysts for processing of petroleum residues generated in refining processes. The aim of this work was to study the degradation of petroleum sludge obtained from primary processing, with applications of an improved thermogravimetry system and HY zeolite, at specific temperature ranges and degradation times, in order to obtain light gases and distillate fuels. The NaY zeolite was synthesized under hydrothermal treatment of a gel containing sodium silicate, sodium aluminate, and water. The obtained solid material was filtered, dried and calcined, and then ion-exchanged with ammonium chloride and calcined in order to obtain its protonic acid form (HY). The samples’ characterization by TG/DTG, XRD, and SEM proved that the crystalline structure of the faujasite zeolite was obtained. 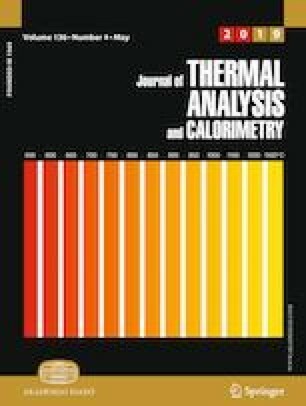 The thermal and catalytic degradation of the petroleum sludge was performed with 1.0 g of sample containing 10% of HY zeolite in the temperatures of 100, 200, 300, 400, and 500 °C, varying the time from 0 to 60 min to each temperature, using an oven with temperature program system, adapted with a Shimadzu precision balance. The curves obtained with this system evidenced that the presence of HY zeolite improves the degradation of the residue, with decreasing of the activation energy for the processes, as determined using the Arrhenius model. The present article is based on the lecture presented at SiAT VIII conference in Punta Grossa - Brazil on August 13–15, 2017. The authors are grateful to the National Council for Scientific and Technological Development (CNPq), CAPES, and National Agency of Petroleum, Natural Gas and Biofuels (ANP—Brazil), for supporting the research.